The story of the two sons of Aaron, who played with fire, but followed their own mode of worship is one of the best-known tragedies. The ‘secret of the twelve’ is a reference to his opinion that the last twelve verses of the Torah were not written by Moshe but by Joshua, because they speak about Moshe’s death and the mourning of the Israelites. What we can understand from Ibn Ezra here is that the last twelve verses of the Torah are an example of a broader phenomenon of later editorial comments in the Torah. I’ve often referred to certain Eureka moments I experienced along the way during different aspects of my education. Well, this Ibn Ezra is a Eureka as good as any other. Let me explain why this is so. Growing up I was taught, consistent with ultra-orthodox philosophy, that that every word, every syllable, and every letter in the Torah is the word of God, verbatim, as dictated to Moshe. What we can understand the Ibn Ezra to be is saying is that there is another view. The belief that the Torah is from God, a basic tenet of Judaism, is not at all at odds with the idea that the Torah as we have it contains many passages which were only recorded much after the death of Moshe. This is perhaps very unsettling to some which is precisely why the Ibn Ezra speaks about it in the most coded fashion. I believe this teaching to be truly liberating and magnificent. Liberating, because it allows us to divest ourselves of the intellectual straight-jacket imposed by some of the more narrow views of the divine authorship. And magnificent because it has the potential to answer so many seeming inconsistencies in the Torah which hitherto have often been answered inadequately. This idea of a third-party narrator has the promise to explain so much of that away, and it predates modern biblical scholarship, which arrives at a similar conclusion, by 800 years or so! The Ibn Ezra is most certainly not “another view” which questions “that the Torah is from God”. חס ושלום! To say I was flabbergasted reading Reti Waks’s “discovery” is an understatement. This transcends the Ibn Ezra! It is an open Gemara in Baba Basra (15b) where two Tannaim argue concerning who wrote the verses describing Moshe’s death, as dictated by God Almighty! It seems Reti Waks, through the Ibn Ezra, has discovered the view of Rabbi Yehuda in the Talmud. This opinion is part and parcel of every “ultra orthodox” curriculum! I am not sure where Reti Waks discovered the “intellectual straight jacket” that he describes, and why it is an affliction. It is not appropriate to write these thoughts (i.e the view of the Ibn Ezra) because I (the Ohr HaChaim) have heard people discussing these verses and becoming entangled in them, to the extent that they end up expressing views which can only be described as heresy. Rabbinic scholars wondered why the Ohr HaChaim used such strong language. After all, it is the view of Rabbi Yehuda in Baba Basra (ibid). Having read the piece from Reti Waks, I see (once more) that the Ohr HaChaim certainly deserves the honoured prophetic appellation of “HaKadosh”. Author pitputimPosted on August 16, 2017 Categories Halacha, KefirahTags ARK Centre, Death of Moshe, Heresy, Ibn Ezra, Shneur Zalman Reti Waks, כפירהLeave a comment on Playing with fire? Over the weekend, I was strongly encouraged to repost my article. I had one comment which was valid in retrospect, and I am taking that fully into account in this revision. I was not aware, but a number of people have mentioned that R’ Shneur Zalman Waks is involved in conversions, including one involving the marriage of a Cohen. I was informed he has his own Beth Din and does not involve the Melbourne Beth Din. That’s not to say his conversions are invalid. I can’t give an opinion without knowing details. If anyone knows, do tell. We have RMG Rabi’s Beth Din which does conversions, R Schneur Zalman’s ARK Beth Din for conversion, Adass which has always been separatist, in addition to the standard and fully internationally accepted Melbourne Beth Din. 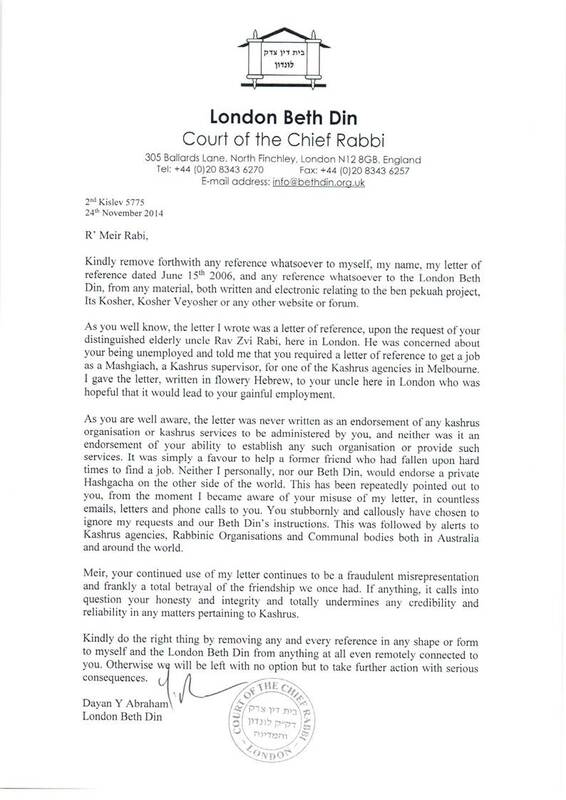 In my opinion, a community should only have one Beth Din and it should be modelled on the Melbourne Beth Din, with its checks and balances from a lay committee, including a separation from money issues. The original reason for this post, however, was that someone sent me emails that Shneur Zalman sends to his ARK community (of which I know little) and I’m commenting on the last one that I received. Shneur Zalman of ARK, is someone who is different and seemingly diverse. That, in of itself, isn’t a problem provided he is sincere and maintains a fidelity to strict Halacha. I’ve decided to intersperse commentary on his most recent article because I found it vexing. The quotes below are verbatim from what was sent to me. Growing up in a strictly Chabad home in the days before internet meant that my information sources were rather limited. We weren’t allowed to listen to radio, watch television, or read ‘secular’ books, so I became a Jewish History buff. This is a questionable representation. There are plenty, including Rabbis, who were and stay intimately involved in many issues and who have strongly different views than Shneur Zalman. The statement that bothers me is that it is crafted to convince ARK congregants that Shneur was born into a prison-like idyllic “crown heights” or “kfar chabad” standard Chabad home of a most orthodox type. This has been a matter of discussion by members of that family itself. I do not know if ARK members have been exposed to counter claims. This is contextually important. The issue of Chabad in particular is profoundly misplaced. All ultra orthodox groups encourage minimisation of interaction with the outside world unless necessary. Of all the ultra groups who have a higher percentage who are exposed to the outside world, Chabad is clearly the one most exposed and experienced (and pilloried as a result). That being said, it might be that Shneur Zalman’s parents had no hidden TV or other devices, and a computer was locked for use for “business” purposes. I do not know. Perhaps he was denied access to the world. It is ironic though that Shneur Zalman’s claimed TV and Radio-avoiding family chose to agree many years ago and feature in full length documentaries for SBS about how they get on with life! I assume these were motivated primarily for the benefit of the non Orthodox and gentiles who do watch TV and whom the family they wished to influence to adopt their “idyllic“ Amish-like lifestyle? I’m sure the parents felt this was prototypical Chabad Chasidism encouraging others to have double-digit children while demonstrating how it could be done with dynamic results. My band members (non Jewish, watched it with incredulity). Maybe this was a form of outreach, though, using the very medium Shneur Zalman claims was discouraged to engage with. I assume Shneur Zalman was part of that documentary. Based on his description, he might appeared like a rabbit in bright lights not knowing anything about the outside world, save his claim to be a self-made “Jewish History buff”, appearing bewildered by the brouhaha. I have not seen the video, as the topic per se had never been of interest to me. From my religious study I already knew about the suffering of the Jews as they were enslaved by the Egyptians, nearly annihilated by the Persians, and oppressed by the Greeks and Romans. But added to that I discovered the long history of Christian antisemitism; peaking during the Crusades, Spanish Inquisition, Pogroms, and of course culminating in the devastating Holocaust. Shneur Zalman has been selective. He implies that his “History buff” knowledge informed him of Xtian antisemitism, the inquisition, pogroms and the holocaust, but these were denied by his education. I find this derisorious. All these events save the last, are covered in formal long lamentations on Tisha B’Av, and spoken about on Pesach. Either Kinos wasn’t said, or understood, or Shneur Zalman met teachers throughout his entire Jewish education who always put a full stop at the Roman Conquest. Everyone is aware of the Holocaust, including the ultra orthodox and the survivors who occupied the pews. Does Shneur Zalman not know what happened because of his religious upbringing at home?. Even Satmar knows! Shneur Zalman is disingenuous about modern-day events. He most definitely would have heard how his namesake was persecuted by the Communists and dreaded NKVD. Strangely, Shneur Zalman doesn’t seem to mention the systematic attempts at destroying Torah Judaism to eradicate the Jewish people in the Soviet Union. The Nazis attempted it physically, the Soviets were happy if one abandoned Judaism spiritually and adopted a (ironically Jewish sourced) Stalinism or Marxism, that considered a Jewish text, to be poison and to be eradicated. I read every book I could get my hands on which told the story of the darkest years in human history and heard the story from the mouths of many survivors. When we then sang the Vehi Sheamda on Seder night, which basically translates that in every generation there are those who want to kill us, it was felt in a most immediate fashion. Shneur Zalman’s own Chabad School has a very good free lending library almost next door to his house. Are we to assume that his parents forbade him to borrow books from that library (let alone his excellent School library) or perhaps they they vetted the books lest they would corrupt their son with hatred to those hell-bent on killing Jews at any time or place? I think not. Is Shneur Zalman being purposefully disingenuous here or just tardy? I’m not sure. At some point I came to question the point of this message. Granted, we should never be complacent about antisemitism. We have suffered too deeply to be so naïve. But I personally never experienced antisemitism. Sure there were Saturday morning drunks who could scream out “bloody Jew”, but to rate that at all would be to belittle the traumas inflicted on our people. So what relevance does the story of antisemitism have to me, my generation, and the ones younger? How did Shneur Zalman know that only drunks screamed this message from their fast-moving car? Is he superman with X-ray vision? It is incredulous that anyone could emerge as a self-proclaimed ” Jewish History buff” and yet feel that because in the short cloistered walk of 1 minute from his house to his School (remember, he claims he was forbidden to be exposed to the real world) he concluded that people who called out “bloody jew” in that moment, were not hard-core anti-Semites. What a strange intuition. It in fact contradicts the beginning of each and every blood bath the Jews faced. Does Shneur Zalman not realise that they all started with small voices of “bloody Jew” and then grew into a society unfettered by morals and ethics proceeding to death and destruction. Does Shneur Zalman not realise that if he took a number plate and reported it to the police that those who said those things would be prosecuted for hate crime? Was Shneur Zalman blind and deaf to a prominent incident, next door to his home, where one of his chassidic colleagues was beaten by off-duty police. It was all over the papers and the talk of the centre. Did Shneur Zalman miss the articles or was he forbidden to read them. Walking with my father to Elwood Shule, we stood in the middle of Brighton Road on the tram tracks. A car load of “young and restless” passed us, rolled down their window, and called out “Bloody Jews”. To me, standing next to my elderly father, a holocaust survivor, this was simply not on. I took off on a fast run down the tram tracks of Brighton Road in my suit, hoping that their car would be stopped by a red light. Luckily, it was. I reached their car, thumped hard on their window and bonnet. Startled, they turned their heads and heard me yell at the top of my voice. I went to the same school as Shneur Zalman. I don’t attribute my then reaction to the school in totality, let alone should Shneur Zalman be insinuating that his lack of understanding of the beginnings of anti-Semitism had anything to do with his home or his school. This was Shneur Zalman’s reaction, and his alone. His sad misunderstanding of anti-Semitism, is there for all to I see in that paragraph. By the way, my father later asked me why I reacted with such crazed venom. I explained that precisely because of the message of Pesach and his place as a survivor, I for one was not ever going to be a Jew who minimised such vituperation in the way that Shneur Zalman seemingly professed to his ARK community in tame words and wonderful sculptures. The most prominent response I came across when I was younger was that we should never trust the Goy. We were even taught in the first chapter of the Tanya, the seminal work of Chabad philosophy written by my namesake, that non-Jews are inherently incapable of good deeds, that whatever seemingly kind acts they perform are for their own selfish gain. What was he getting at, I thought? Was he saying that he was taught that a non-Jew was more likely to thrust a knife in his back than a Jew? If so, statistics would say that this is entirely correct whether one is ultra orthodox or not. Does Shneur Zalman not know of a gentile reporter who recently donned a Yarmulka and found that this immediately made him a magnet of hate, violence, and derision. Heck, the reporter was featured everywhere. Does Shneur Zalman still not read the popular press? Perhaps he subscribes to the doctrine that it’s all because of the “settlements”. I guess the prime settlement of Tel Aviv, which is still claimed by Hamas and their ilk as the problem as well as the mere existence of Jews? Or perhaps Shneur Zalman sides with Neturei Karta or Mahmoud Abbas, that a Jewish homeland, should never exist? Alternatively, he might be one of the mixed up clerics who think that sharing bread and holding hands with clerics of other religions espousing “social justice” will solve the latent hate blatantly expressed in the texts of their religions, while clasping hands for photo ops. Will Shneur Zalman change that? It has never solved anything. I don’t see a “Jewish history buff”. Now, I do not profess to have more than a simple passing knowledge of Chabad metaphysics as described in Tanya, but I do know that it is not a Shulchan Aruch as Shneur Zalman had his ARK members misunderstand. One of its tenets, which isn’t universally held (I hope Shneur Zalman is able to transmit authentic other Orthodox approaches and that he isn’t still in the “imprisoned cloistered” youth that he painted, Tanya is a collection of older texts rewritten coherently and beautifully. Jews do have an element of Neshama that non-Jews do not. The oldies used to call it the “pintlele yid”. This has ramifications to understanding conversion, and whilst it most certainly is a valid understanding of Judaism, I’d hope Shneur Zalman isn’t on some populist anti-Chabad rant presenting it as the only Orthodox approach to understanding the metaphysics of the soul. It seems that Shneur Zalman either forgot, or chose not to mention many Talmudic statements which, if understood in a simple way are far more contentious. More importantly, projecting other Orthodox approaches would be a great idea if he didn’t “like” the Tanya’s sources. What I can say without any doubt is that his namesake was an absolute giant of an intellect on par with the Gaon of Vilna, and was possessed with a love of Jews and the future of Judaism that was legendary. That he chose sides in the Russian/French non-Jewish conflict is remarkable. Perhaps Shneur Zalman should tell his ARKers about how his name sake made the right choice and that almost single-handedly saved Soviet Jewry from obliteration. To this day, moderate Rabbis such as Rabbi Riskin make kiddush on Vodka on Shabbos because of the incredible legacy that Shneur Zalman’s name sake left in Russia. Shneur Zalman will readily admit he isn’t a boot lace compared to his name sake: either in matters of standard Jewish Law, or in matters of Jewish Metaphysics or as a Jewish History buff. Is there anybody today? Next Shneur Zalman makes what seems to be a leap of logic from his earlier statement, that confounds understanding. But that is a very depressing message. Moreover, it contradicts our experience. And most importantly, that message is precisely the message propounded by the most evil of people. I mean isn’t that precisely what Hitler was saying in the inverse? Surely that can’t be the moral of the story. Shneur Zalman, it would be profoundly incorrect to assume that every non-Jew is an anti Semite. It would also be wrong to assume that many non Jews are indeed anti semitic but it’s definitely on the rise. I have personally experienced it in today’s age of the culturally sophisticated. Hitler? Has Shneur missed out ? Has he taught ARK about Amalek? We read it today in Shule. I know of no Jewish gangs who take baseball bats to Lakemba or Coburg with the aim of obliterating Lebanese Muslim anti-Semites who openly say Jews should all die (as does Hamas). Again, perhaps Shneur Zalman has not caught up with current events? He seems to live in a utopian but unrealistic world. Over the last two weeks, ARK Centre has been hosting an incredible exhibition put on by Courage to Care that provides an answer to this question most profoundly and resolutely. We must remember the suffering of our people not in order to perpetuate trauma but to learn the evils of bigotry and what happens when good people stand by and allow it to happen. We must learn to be up-standers, not by-standers! The exhibition contained a number of evocative pieces. The one that affected me most deeply was a piece by an incredibly inspiring, youthful, and optimistic, 89 Year old Sarah Saaroni. It is a sculpture of Dr Janusz Korczak, a paediatrician and head of an orphanage, who had an opportunity to save himself but decided to stay with the children as they were gassed to death. In the sculpture he is holding, embracing, and comforting a dozen children or so as they are standing in the gas chamber. The image really is heart wrenching and now, as a father of two beautiful children I love so dearly, it really is difficult to process. But the sculpture is more than a statement about the unbelievable depravity of the Nazis who could do this to pure children. It is a tribute to the spiritual depth of the doctor who, in the midst of absolute darkness, was able to radiate a beam of holiness, of love. His facial expression left me, and I dare say anyone who sees it, with a sense of warmth and serenity. I’m not sure how Shneur Zalman’s religious education seems to have forgotten the concept of the other Chassidim. Yes, the חסידי אומות העולם. The righteous gentiles. Note: they are called Chassidim, Shneur Zalman. I do hope Shneur Zalman exposes ARK to that concept. It was there well before the cultured sculptures, and has a history as long as the history of anti-Semitism. Furthermore, his namesake writes about them and their reward in the world to come. Is Shneur Zalman trying to turn his congregation into populist left-wing tree huggers? Let Shneur Zalman break bread and condemn Senator Lee Rhiannon of the loony greens to ARK. Would he? Perhaps he should remind ARK about German Jewry who were more German than the Germans, and that it did not help them in the “advanced” socialist democracy of Germany. Don’t misread me. I interacted with 400+ non Jewish alumni on my Facebook. I didn’t have family or friends on facebook. I recently lent a significant amount of money to a non-Jewish colleague who had to fly back from overseas because her father and uncle dropped dead. The message I give Shneur Zalman is, rather than the seemingly post-modern one he is giving ARK, one can be centrist orthodox with an absolute fidelity to Halacha and live in this world peacefully, especially with tolerant non Jews. I can tell Shneur Zalman, that if I ever meet an intolerant or anti semitic type who threatens me overtly or covertly, I turn into a different persona. I don’t sit down to “break bread” with them. I know exactly with what I am dealing, and any “Jewish history buff” will affirm this. This is a message that is so relevant and extremely positive. This is, in fact, what the Jewish tradition is all about. We are not the Chosen People of a superior race as I was taught. Rather we are a people who have, unfortunately, experienced immense suffering as a result of bigotry and the absence of enough up-standers in our midst. This experience of being a stranger in a strange land endlessly persecuted compels us to be the preachers of light; to declare that all human beings are created in the image of God and, therefore, all equally deserve to be treated with compassion, dignity, and humanity. To the whole team at Courage to Care, thank you for your vision and dedication to fulfil it. With hope and prayer that we internalise this message and turn our horrible history into a reservoir of inspiration to become more sensitive and caring human beings especially to those who are very different to us. I couldn’t disagree more with this contorted configuration of childhood and this message. My own family was saved by righteous gentiles who were honoured in Yad Vashem. I have visited them. For close to 70 years, the extended Balbin family still sends all our surplus clothes to their extended family. A number of their family are anti Semites. They hid the fact that they saved Jews. When the husband of the girl found out, he beat his wife constantly. She held it a secret for some 30 years because she knew he was a depraved anti-Semite. We send them money and medicine too. (One of the family couldn’t even stand being in the room with me and my father, and left). This, despite the heroic efforts of his mother and her father). Some morality! In short Shneur Zalman, I find this newsletter message rather populist, misleading, and simple. I’d rather if it was more learned and candid and more informed and realistic. The simple reading of history today, actually matches the claimed simple education Shneur Zalman claims to have received! He didn’t receive a simple education. Is he a member of the Rabbinic Council of Victoria? Why doesn’t he break bread with them and convince them of his views and how they conform with Halacha. This is the Rabbinic way. I take that back if he does not consider himself or ARK Orthodox. Enter your email address to follow this blog and receive notifications of new posts by email. I don't look at this information.